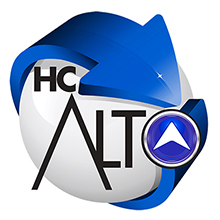 HC Alto (Hi Chrome Services Ltd) appreciates your interest in our company and its products. We take the protection of your privacy when using our websites very seriously. In the following we are pleased to inform you about the collection of anonymous and personal data. In general, you can visit the websites of HC Alto (Hi Chrome Services Ltd) on an anonymous basis, i.e. without informing us of who you are. When you visit our website, our web servers save as standard the IP address of your internet service provider via which you access our website, the site from which you access our site and the files you access from us, as well as the date of your visit and general information about your browser. These data are only analysed in anonymised form for statistical purposes. We save and process personal data only if you provide us with this information voluntarily, e.g. by completing a contact form or registering for personalised services. You will be informed of the intended purpose on the corresponding sites and, if necessary, asked for your consent to the saving and processing of the data. Data will only be forwarded to service providers connected with us e.g. in order to send requested written information to you. All service providers are of course obligated to maintain data secrecy and confidentiality. Other information. Your personal data will be saved and processed in accordance with the data protection provisions of the country in which the website is operated. Copyright 2014 Hi Chrome Services Ltd. All rights reserved. The content including pictures and the design of the HC Alto (Hi Chrome Services) website are subject to copyright protection and other laws for the protection of intellectual property. No dissemination or alteration of the content of these pages or of the frames or similar measures are permitted. Moreover, these contents may not be copied, disseminated, modified or made available to third parties for commercial purposes. The information that HC Alto (Hi Chrome Services Ltd) presents to you on this website is compiled and updated periodically. It is impossible to guarantee freedom from all errors. For this reason, HC Alto (Hi Chrome Services Ltd) disclaims and excludes all liability or warranty with regard to the accuracy, completeness and validity of the information provided on this website. There is no warranty of merchantability, no warranty of fitness for a particular use, and no other warranty of any kind, express or implied, regarding the information or any aspect of this website. In no event will HC Alto (Hi Chrome Services Ltd) or other companies mentioned at this site be liable for any damages whatsoever arising out of the use, inability to use, or the results of use of this site, any websites linked to this site, or the content contained at any or all such sites, including but not limited to damages to computer system, data or any personal objects resulting from the downloading of material and/or data from this website or from websites reached by links from this website. HC Alto (Hi Chrome Services Ltd) reserves the right to undertake alterations or additions to the information or data provided at all times without further notice. Insofar as our Internet pages contain forward-looking statements, these statements are based on opinions and estimations of HC Alto (Hi Chrome Services Ltd) Management and are subject to risks and uncertainties. HC Alto (Hi Chrome Services) is not obliged to update such forward-looking statements. All liability for such statements is expressly excluded. Unless otherwise indicated, all trademarks used on Hi Chrome Services Ltd Internet pages are protected by trademark law. The same applies to company logos and signs. The intellectual property contained on this website is legally protected through patents, trademarks and copyrights (Where applicable). This website does not grant any license to use the intellectual property owned by divisions of Hi Chrome Services Ltd. Duplication, dissemination, reproduction and further transmission and other use are prohibited without the written consent of Hi Chrome Services Ltd.
Use of this website and the interpretation of this Disclaimer shall be governed by and construed in accordance with the laws of United Kingdom, without regard to conflict of law provisions. Any dispute arising out of this Agreement shall be resolved in the courts in The United Kingdom. Through your continued use of this website, you agree to submit to the personal jurisdiction of the courts of The United Kingdom. HC Alto (Hi Chrome Services) and you agree that service of process may be made by electronic mail to your electronic mail address that was used when accessing this website. HC Alto (Hi Chrome Services Ltd) may change this Disclaimer at any time without notice to you and without liability to you or any other party. It is your responsibility to periodically check this Disclaimer for changes. If you do not agree to any changes made to the Disclaimer, you should cease use of this website. Continued use of this website signifies acceptance of any changes made to the Disclaimer.